An innovative 3D scanner designed by a pig farmer to weigh finishing pigs has won the Pig World New Product Award at the British Pig and Poultry Fair. The Fancom eYeGrow, created by Shropshire producer Harry Heath and his brother-in-law Ben Nimmo, a software designer, continually monitors the pigs in a pen, feeding information back to a computer to accurately calculate weight. The data is constantly available to the producer via a phone, tablet or computer. The judges, NPA chairman Richard Lister, AHDB’s Nigel Penlington and Pig World editor Alistair Driver, identified the product as a clear winner after visiting the 10 shortlisted contenders entered into the Fair’s Innovation trail. The internet-based eYeGrow, which is sold through JF McKenna, is suspended a few feet above the pigs inside the pen, taking up to 20,000 3D images a day as pigs pass beneath it. Using these images, it generates weight data with a 3% error margin. It is very important to monitor the weight of pigs, but manual weighing presents all sorts of practical difficulties, Harry said, explaining the motivation for developing the system. Unlike manual weighing, the 3D scanner is completely stress-free for the animals and requires no additional labour input, he said. The data is readily available to farmers in ‘real time’ and allows them to monitor progress of pigs, for example growth rates and feed conversion ratios, and respond quickly to any problems that arise, as shown in the data. The system also enables producers to rapidly gauge the effectiveness of any changes made to in management of the pigs. The eYeGrow took four years to develop with the first system installed on Harry’s farm. The product was recently launched in the UK and has been installed on a handful of farms. “We need to know about weight continually throughout the process as historic data is no good,” said Harry (pictured left, with NPA chairman Richard Lister, below the scanner) . The judges were looking for a new and original product that has the potential to deliver long-term benefits to the industry from an excellent and varied shortlist. 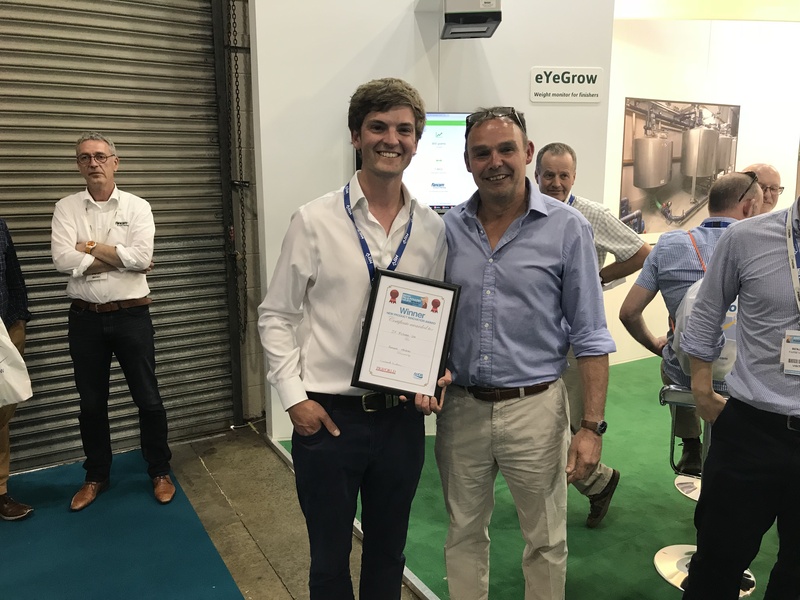 Mr Lister said: “This was a clear and deserved winner – a product designed by a farmer for farmers to address a difficult problem – the need to constantly monitor the weight of physical pigs. The eYeGrow 3D scanner provide is able to collect this very valuable data with no stress to the pigs or extra effort for staff – we were also impressed with how the data is made available in a user-friendly way to the producer. The cyclone is mounted on the silo leg and connected to the exhaust pipe via a hose. A robust slide enables straightforward emptying after filling. 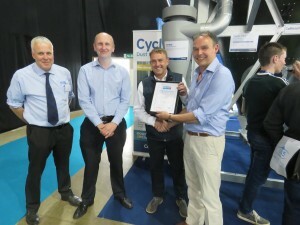 The judges presented the company with a ‘Highly Commended’ certificate on the stand. Techneat Rotamoulding/Contented Products – Merlin clean water & dosing system.